Right to protest and freedom of association! 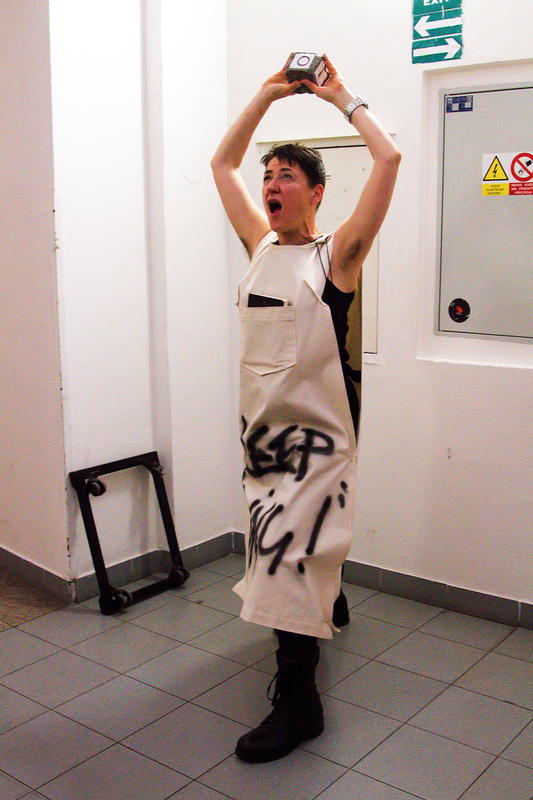 These three live art sitespecific actions were performed at 'How does Performance Philosophy Act? – Ethos, Ethics, Ethnography' (the 3rd biennial Performance Philosophy conference) These live art works/tableau vivants occurred throughout the conference at various locations (i.e. 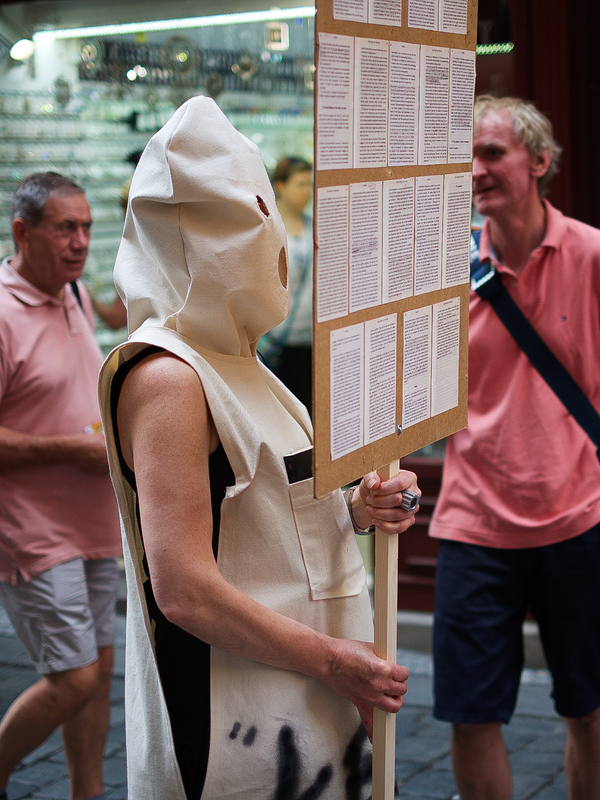 not scheduled events but ‘pop-up actions’) employed the visual trope of the protest placard to advocate the role of philosophical reflection for human flourishing and to evoke connections between abstract thought and physical action. The appropriation of ‘Article 11’ in my title was intended to be playful and thought-provoking, the reference to ‘freedom of association’ was intended to imply the important association of performers and philosophers where much is of stake for future cultural creation. 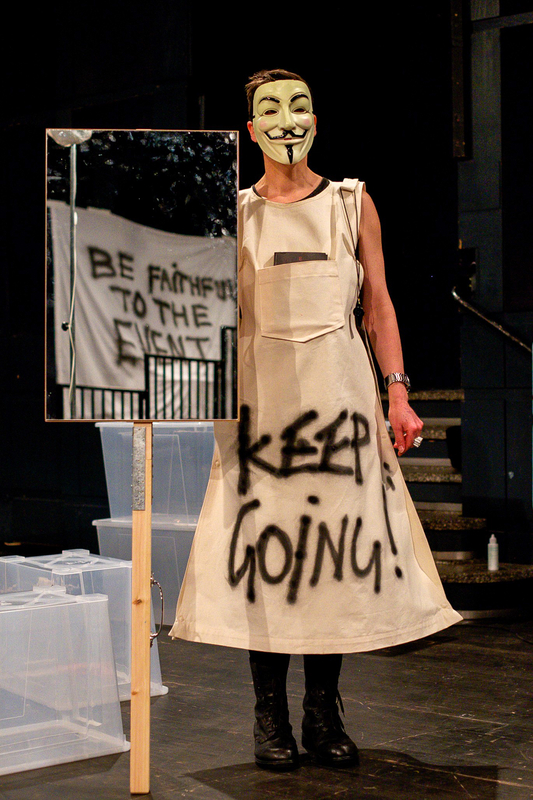 My artistic ‘protests’ acted as embodied ‘creative advocations’ linked to the conference concerns and were intended to rely on the visual power of the solo figure caught up in philosophical gesture and conviction. The key action accompanied each of the key note speakers on the main stage and incorporated a quote from the work of philosopher Alain Badou. The second action took place in the stair wells of the venue and confronted participants as they moved between conference rooms. The third action took place in public amidst the busy streets surrounding the venue.